Home > tech > Will Tesla Model 3 Recharge the U.S. EV Market? Will Tesla Model 3 Recharge the U.S. EV Market? Orders were flooding in even before Tesla CEO Elon Musk revealed the car to a giddy audience last Thursday evening, with prospective buyers queuing at Tesla stores throughout the day to place a deposit on a vehicle they might not even receive for two years or more. Musk made the case for EVs being “really important for the future of the world,” combating rising greenhouse gas emissions and air pollution. The Model 3 is really important for the future of Tesla and the future of EVs. It promises the sales growth that automotive wunderkind Tesla needs to survive and renews interest in a technology that is yet to have significant real-world impact. Yet even with the introduction of Tesla’s flashy new sedan, more pieces need to be in place before the EV market goes truly mainstream. When the Chevrolet Volt plug-in hybrid and Nissan Leaf battery-electric vehicle hit U.S. showrooms in December 2010, the price of gasoline was rising, and so were expectations for the future of EVs. Shortly after, President Obama articulated the goal of having one million EVs on U.S. roads by 2015, and committed billions of investment in EV manufacturing capacity, recharging infrastructure deployment and vehicle purchase incentives. Five years later, the reality is somewhat different, with the market for hybrid and electric vehicles stagnating (see figure below). 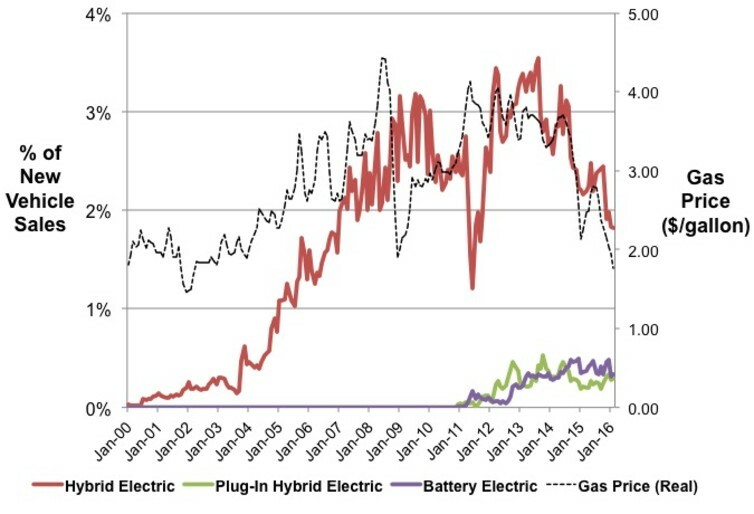 Only 415,000 plug-in hybrid and battery-electric vehicles have been sold to date, achieving no more than one percent of new vehicle sales, and conventional hybrid vehicles have fared little better, following the price of gasoline down over the past two years. With gas cheap, sales of SUVs and pickups are booming, and all evidence suggests that mainstream car buyers simply do not want the green vehicles that are available currently. Why then might prospects for EVs be different looking forward? The answer lies in the rapid reductions in lithium-ion battery prices that are being achieved, falling 70 percent since 2007 to US$300 per kWh. These battery improvements have the potential to significantly affect EV performance compared to gasoline-powered cars. The next wave of electric vehicles, led by the Tesla Model 3 and Chevrolet Bolt, promise more than 200 miles of electric range for $35,000, which advocates hope will be a sweet spot for consumers. To say that $35,000 for a midsize car is affordable for mass-market consumers, as some have suggested, is optimistic to say the least. However, continued development of these second-generation EVs could soon challenge (again) the gasoline/internal-combustion regime that has dominated global automotive markets for the past 100 years. But when a mass-market transition to EVs may occur remains uncertain even with falling battery prices. A recent report by Bloomberg New Energy Finance received widespread attention for suggesting that EVs would be cost-competitive with gasoline vehicles by 2025. Significant further advances with batteries would be needed for that to occur. Even so, building a market for EVs that is ecologically and economically sustainable requires more than just cheap batteries. EVs will go mainstream only when everyday car buyers understand the technology, have a wide range of EV makes, models and body styles to choose from, and have access to a ubiquitous network of fast charging stations for long trips. Only Tesla can claim to offer significant charging infrastructure coverage today with their growing network of proprietary Supercharger stations, and Tesla faces other challenges internally as they learn to manufacture vehicles at scale with high quality. The greatest impact of the Model 3, then, to the benefit of the entire EV industry, may be in convincing consumers that EVs are no longer just for treehuggers and techies. In launching pre-sales far in advance of production, Tesla has empowered 275,000 people (and counting) to tell everyone they know that their next car will be electric, long before the first Model 3 hits the road. For the struggling field of electric cars, that’s a real vote of confidence. David Keith receives funding from the MIT Energy Initiative, whose financial partners and advisory board members include energy, automotive, technology and consulting companies, utilities and non-profit organizations.